Late January, 1988: The waves were four to six feet from the northwest and accompanied by a cold 20 mph northwest wind  not unusual conditions for the San Francisco Bay Area in the middle of winter. The waves breaking offshore around my hometown of Pacifica were choppy and unsurfable. My only chance of finding anything to surf that day was to head for a nearby cove that was protected from the wind. It had a triangular shaped reef that organized the unruly waves in surfable form as they broke over it. When I arrived, I stood on the cliff's edge and watched Rob "Birdlegs" Caughlan, Past President of the Surfrider Foundation and a veteran local surfer, get some decent rides. No one else was out. Next to me were two young surfers about ten years old. I couldn't help but overhear the following conversation, which was not about the waves but about Rob. 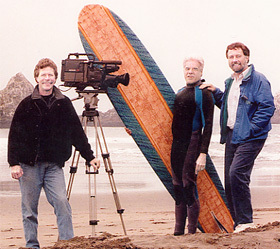 Above: SFL Producers David L. Brown, left with Roy Earnest, right, and Rob Caughlan (center). Boy #1 said, "Do you know how old that guy is out there?" Boy #2 responded, "No, but he sure has a lot of gray hair! How old is he?" Boy # 1 shot back emphatically, "He's 45! Same age as my Dad!" Boy #2 came back with, "Wow! I'm surprised he can remember how to surf. Don't people get real forgetful when they get that old?" At that point, they both cracked up laughing. For a moment, I considered pointing out to them that severe memory loss resulting in forgetting how to surf is rare as we age - at 45 or at 75. Instead, I just walked down the cliff trail and paddled out. I figured they'll learn the truth on their own when they're ready, and - after all - they were only ten years old and living in a world that hates getting old! Nobody else joined us that day even though the wind dropped and the waves improved. It was just us two "geriatric surfers" having a great time! As a gerontologist, social worker and long-time surfer, I was sparked by the boys' comments to think about the "graying of surfing." Ever since the modern era of surfing began, the sport has been associated with youth, and with good reason. In unprecedented numbers, the baby boom generation (persons born between 1946 and 1964 - as well as those born a few years on either side) took to surfing with passion. This huge swell in the number of births - or Age Wave as gerontologist Ken Dychtwald, Ph.D. calls it - came along just when interest in surfing exploded in the late 1950s and early '60s. The "baby boom" caused a "surfing boom." As we all know, the sport's popularity among youth continues. However, it is increasingly becoming an intergenerational sport/art/lifestyle. For most of us "geriatric surfers," the thrill of riding a wave is just as sweet today as it was in years past. This evolution in the surfing world started in the 1970s when the age wave began to show on the horizon. Surfers who had been surfing steadily since they started in the 1950s, 60s, and 70s began to become older than the "typical age of a surfer." They began their careers and/or family; perhaps they bought a house, went to school, or traveled . . . and they kept surfing. Combined with a steady stream of grommets (i.e. young beginners), an increasingly intergenerational group was surfing together. During the 1980s, the experience of surfing with three generations became increasingly common. The scene of a son or daughter surfing with a father and grandfather was not from a movie script  it was from real life. Many who used to surf a "while back" returned to surfing because they discovered that "there are few things as fun as surfing." The renewed interest and acceptance of longboards (surfboards 9' +) eased the re-entry for many of these returnees due to these boards' stability and wave-catching qualities. During the 1990s, the age wave began to sweep over surfing and change it. It should no longer be a surprise when a surfer is over age 40 or 50, and yet, it does surprise many  mostly non-surfers. The growing number of surfers over 50 (who are eligible for membership in AARP) jolts many people's view of what older people "should do," and that jolt gets stronger as surfers get older. "Woody Brown, at 89, still surfs?! That's AMAZING!" people exclaim. Then many of them wonder: "Isn't surfing something for kids? "; "Could this be a case of arrested psycho-social development? Hasn't he outgrown that? "; or "Don't you have to be in top physical condition to surf? I couldn't do that." For the surfing community, the answer to all of these common but "ageist" questions is "NO!" Older surfers provide a great metaphor for how our society is struggling to redefine what it means to grow older. Similar to the Civil Rights and Women's movements, this age wave is tantamount to a movement and involves new behaviors  with the new attitudes trying to catch-up. Could it be that "staying young" doesn't need to be the goal after all, and that "staying well"  physically, spiritually, emotionally and mentally  becomes the goal? It's possible if the term "OLD" can shed some of its unnecessary negative connotations and stereotypes. The new attitude that is emerging  and supported by lots of medical and psycho-social research  is a view of our later years not dominated by sickness and decline. Rather, the later years can be a very vital, satisfying and meaningful period of our lives. There is profound truth in the words of 71-year old surfer, Fred Van Dyke: "If I'm getting old, I might as well dig it." And there is wisdom in the enthusiasm of 93-year old surf legend Doc Ball when he says that, "Surfing helps me to stay stoked." While surfing may not be as "aging friendly" as golf, gardening, or a long walk, Fred Van Dyke (71), Rabbit Kekai (81), Woody Brown (89) and thousands of others are demonstrating that surfing can be an "aging friendly" activity. The 40 and over age divisions in surfing contests have become very competitive during the past few years. Any competitive surfer approaching 40 who thinks the competition will now get easier, should take a step back and think again. Obviously, the primary key to staying "stoked for life" or, for that matter, just staying vitally involved with life, is to maintain our health and a positive mental attitude. The "wellness movement"  another major social movement of our time  contributes to this goal through the dissemination of easy-to-understand health-related information. Wellness programs also offer many incentives to stay fit, and to manage chronic health problems more effectively so we can continue surfing or pursuing whatever activities that give our lives meaning. More and more of us are figuring out that the mere "absence of illness" is not a complete health goal. Instead, we are searching for a more optimal level of wellness that prevents illness and is appropriate for each of us (i.e. your optimal level of wellness may not be the same as your surf buddy's). We are doing this through regular exercise, improved nutrition, stretching, taking care of ourselves emotionally and spiritually, stress reduction and a whole litany of other methods and techniques. Thanks to the "wellness movement," we are empowered to take charge of our own health and to become partners with our physicians and other health professionals rather than being passive recipients of their expertise. When we embark on this new health path, the results are obvious  we feel better. Research in aging indicates that it is almost never too late to start taking care of our health and to achieve a positive outcome. Current longitudinal studies on the impact of better health practices in later life are beginning to show significant results in improved overall fitness. Much of what is considered an inevitable part of aging - arthritis, stroke, heart disease, back problems, skin cancer, etc.  is preventable, modifiable or manageable. From a surfer's perspective, one interpretation of all of this data is that many under 50 have a good chance of surfing into their 70s and beyond. The impact of the age wave and wellness movements will continue for many years to come. There is at present an irresistible demographic and societal groundswell for healthy aging, and surfers will help redefine what it means to be an elder. The surfers now over 60 are pioneers, showing us what is possible and prompting many of us to re-consider our own futures in a more hopeful way. Eventually, surfing and many other aspects of active living will lose their exclusive connection to youth. In their place will be a more expanded view of what it means to grow older. DON'T WORRY BOYS! You probably won't forget how to surf  and neither will I. KEEP SURFING! Roy Earnest, 47 years of age, has been surfing since 1962 and is a founding member of the Pedro Point Surf Club in Pacifica, California. He is a gerontologist, clinical social worker and currently the Director of Family Service Agency of San Francisco's Foster Grandparent/Senior Companion Program. Roy has served as the Past-President of the California Specialists on Aging and Past-President of the Coalition of Agencies Serving the Elderly in San Francisco. In collaboration with filmmaker David L. Brown, he is co-producer of SURFING FOR LIFE, a one-hour documentary about healthy aging that profiles and honors many of the pioneers of the surfing world. Roy Earnest can be contacted by email at agewaver@well.com. His mailing address is 690 Alta Vista Drive, Pacific, CA 94044. Phone: (650)359-7782.